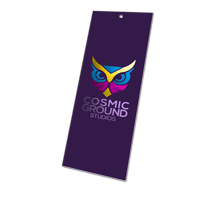 Bookmark printing is an inexpensive way to promote your brand, service, product, or even yourself. Although known as a classic staple for readers, bookmarks have become a great marketing tool even in the digital age. Their compact size makes them a handy giveaway at networking events, celebrations, and on the street. This mini flyer of sorts will be picked up more frequently than an actual flyer since it does double duty as a bookmark! Your brand, artwork, or special message will be seen over and over. 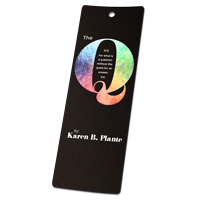 Custom bookmarks are made from sturdy cardstock and come in a wide range of sizes, coatings, and finishes. With front and back full-color printing and a high-gloss UV coating, you’ll get crisp colors and vibrant images every single time. You can even jazz it up with foil and metallic colors. With all these dazzling custom bookmark printing possibilities, you can create the perfect bookmark of your dreams. Always within reach. Because of its compact size, bookmarks can be easily stored in your pocket, bag, or wallet. This also means distributing them anywhere will never be a hassle. Serves a purpose. 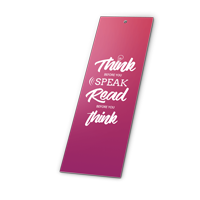 Bookmarks are not just seen as a promotional item but as a valuable gift and a functional tool. In demand. People of all ages will need a bookmark or two at one point in their life, especially those who are avid readers. Makes you look smart. Bookmarks have a distinct connection to education and learning. When you create bookmarks, you are drawing a connection to intelligence for your company. PrintPlace provides free templates and help from our friendly print experts, so you can create the custom bookmark you need hassle-free. Just add your artwork to our templates. Get everything print-ready and you’re all set.